As we hop off the vehicle and walk into the school, twenty-four year old Ajmeer runs up to the door, and pointing to the van mumbles something I can’t quite understand. He has such a broad smile and dance in his eyes that I can’t help but smile back and ask again what he said. And still I can’t understand what he says. Ajmeen is the newest member of the “boys” at the Colombo Centre for Special Education (CCSE). He has been diagnosed with meningitis, is hyperactive and suffers from seizures from a very young age, but none of that prevents him from being outgoing and friendly, keeping up a running commentary as we tour his school. CCSE is dedicated to providing a safe and positive environment for men with autism, Down’s Syndrome, cerebral palsy and other mental conditions that affect learning. “Most of them are very sheltered in their homes” explains CEO Charika Muttiah, “and this is one place their parents and caretakers are sure they will be loved and not abused”. Charika’s designation is fancy, but the work she does is far from that. “I have a very small staff here and I tax them to the maximum” she tells me even as she sits down on a piano-stool to look through a sheaf of papers and put her signature on them. They have hit the bottom of their funds. “We are not secure by any means” is the confession Charika makes to me. CCSE is running on the interest off a few investments they’ve made, she explains, and that is stretched thin every month. Most of the parents and legal guardians of the students pay a fee of “whatever they can”, but the CCSE’s main source of funding is private donations, and these are no more all that forthcoming. 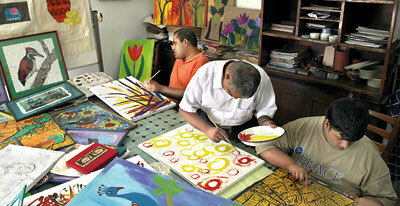 Each year, CCSE engages in a number of fundraisers, the highlight of which is the annual sale of work. Through these events they acquire funds to cover their costs and make a little profit, but according to Charika, nothing substantial that can keep the centre running smoothly. “We are such a small group” she tells me almost regretfully, “even to engage in something like a walk is difficult”. It is not that they lack the spirit, but the practical tools to put ideas to action. Many of the CCSE’s students are already a burden to their families, their siblings, their legal guardians who care for them, and the CCSE is their only source of hope and relief. But the organization itself is now approaching not-so-solid ground. “Security” is a word that keeps returning ominously to our conversation, and I am struck by the irony of how secure the students seem in this place. Some talk and laugh as they are taught basic math, others silently concentrate on their sewing or craft work. There is an air of peace and contentment that pervades the schoolroom. It is unbelievably calming and refreshing. The school is in fact an airy house at 80/7 on Layards Road, the main hall and verandah of which have been equipped for teaching math, sewing, art, carpentry, woodwork and other simple skills. The hype these days at CCSE is the Art room. One suspects that this is most often the case, but these days more than ever because ‘Expressions 2012’, an exhibition of art and craft by the students at the centre is kicking off at the Lionel Wendt Art Gallery on June 21. The exhibits are set to be revealed at 9:00am by Chief Guest Mrs. Sunethra Bandaranaike at the gallery, which will be open to public until 6:30pm. There are paintings upon paintings in the art room, some done with oil paints, others with acrylic, still more in chalk and pastel, and even a few in mixed media. But the best thing about these paintings is the obvious strength of genuine character that speaks through their forms and colours. the art room. pic by M. A. Pushpa Kumara. This is no surprise considering the artists themselves are a lively and interesting bunch. The 28 “boys” as the gentlemen of the institution are called, are between the ages of twenty and sixty-five, and though the CCSE website (www.colombocse.org) reports fifty percent of them lack an understanding of basic instructions, it is impossible not to admire their focus and patience. And even as they are intent on their work, it is impossible not to enjoy their company as they ask simple questions and delight in the most mundane answers. But for many, the true gift of spending time with them is that of pure love and complete forgiveness. “It is amazing” says art teacher Anusha, who has been working at CCSE for roughly a decade now, “you hurt them, they walk the other way and come back the next minute to kiss and hug you”. Her face exudes a brilliance of calm, and the other teachers I meet, Jean, Sister Agatha, Aunty Irene, are all radiant. The love is tangible. It seems that the beneficiary-benefactor roles are reversed and that it is the teachers and staff that gain from the presence of the students in their lives. Even a brief visit of just over an hour has left me feeling simply content for the rest of the day. Make time for the exhibition on June 21, have a look at the paintings and tonnes of other nifty craft-work and most importantly, meet the artists. Do this not for their sake, but for your own. Please check out the CCSE website and don’t hesitate to contact them; any form of volunteerism would be welcome, am sure!